Diwali is one of the most widely celebrated festivals, in India and around the world. It is a joyous Festival of Lights when families unite on the darkest night of the year to light candles, set off fireworks, give gifts, and celebrate together the victory of light over darkness. Many wonderful tales of the Gods and Goddesses – Ganesha, Lakshmi, and Krishna – are told during Diwali. We are going to tell you one of our favourite stories. This is the wonderful tale of Prince Rama and his beautiful Princess Sita, told by Valmiki in the epic Ramayana. Prince Rama was one of the greatest heroes of India. His wisdom and bravery, and that of his virtuous wife Sita, are justly celebrated even today all over the world. And during Diwali we celebrate their triumph at the end of many harsh trials. The story begins long ago in the kingdom of Ayodhya. In that happy land reigned a wise and powerful king called Dasharatha. King Dasharatha had three beautiful and intelligent wives: Kaushalya, Kaikeyi, and Sumitra. “Let us pray to the Gods,” said King Dasharatha to his wives. So Dasharatha and his queens prayed fervently to the Gods in heaven. Finally their prayers were answered when a divine being arose from the sacrificial flames holding a bowl of payasam, rice pudding. King Dasharatha shared the payasam equally between his three wives, but a crow swooped down and took Sumitra’s portion before she could eat. Queen Kaushalya and Queen Kaikeyi immediately shared part of their portions with Queen Sumitra. When the proper time had passed, each of the queens gave birth to a son. Kaushalya gave birth to Rama, Kaikeyi to Bharata, and Sumitra, because she had eaten two portions, gave birth to the twins Lakshmana and Shatrughna. These four sons of King Dasharatha were God given and were all embodiments of the great Lord Vishnu, hence their beauty, power, skill and strength. But Prince Rama was the bravest and wisest and most handsome of them all. On hearing this, the entire Kingdom erupted in an outpouring of joy. But there was one person who was not pleased at all. This was old Manthara, a hunchbacked servant of Queen Kaikeyi, mother of Prince Bharata. Manthara craftily poisoned Kaikeyi’s mind against Rama with lies. “When he becomes king, Rama will turn on your son Bharata and exile him. Or worse!” She convinced Kaikeyi to go to the King and demand that her son Bharata be named successor, and that Rama be banished. King Dasharatha was heart-broken, but many years before, he had made a vow to grant Kaikeyi anything she wished, so he had to agree. Rama calmly obeyed his father’s instruction to stand aside for his brother Bharata. Without a single word of complaint, he prepared to leave Ayodhya for life in the jungle. “I will accompany you,” said his wife Sita. 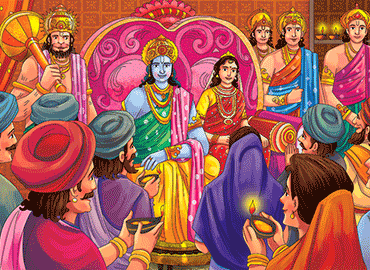 Rama tried to persuade her to stay in Ayodhya, but she would not hear of it. She exchanged her beautiful clothing, fit for a princess, for rough clothes suitable for a jungle dweller. Rama’s loyal brother Lakshmana also vowed to join them in their humble life far from the comforts and luxuries of the royal palace. Bharata, devoted to his brother Rama, was shocked at his mother’s actions. Rama gave Bharata a pair of his sandals, and Bharata immediately placed them on the throne as a symbol of Rama’s rule. Finally Rama, Sita and Lakshmana left the palace. They said farewell to the grieving citizens of Ayodhya, and began their journey to the jungle for their years of exile. While all this was taking place, there lived, in the far off island of Lanka, a cruel and powerful demon king called Ravana. He was fearsome to behold, with ten heads and twenty arms. He rode in a chariot pulled through the air by man-eating mules with sharp teeth! Evil Ravana sent his demons out from Lanka to oppress the wise men and women of the world, to disrupt their sacrifices to the Gods and Goddesses, and to make the lives of ordinary folk miserable. When Rama, Sita and Lakshmana arrived in the jungle, the wise men and women greeted them joyfully. So Rama and Lakshmana took up their weapons and fought Ravana’s demon hordes. They protected the wise men and women from the vicious attacks by the demons that owed allegiance to Ravana. After some time, Ravana’s angry demons, brought word to him that two mighty heroes were driving them away from their victims, and were continually defeating them in battle. Ravana was outraged and decided to take revenge on Rama. He flew in his chariot pulled by flying mules to Rama’s jungle home. Seeing Rama and Lakshmana living a simple life with the beautiful Sita, Ravana devised an evil plan. He decided to kidnap Sita and make her one of his wives in Lanka. By a trick, he lured both Rama and Lakshmana away from the jungle hut where they lived. Then he disguised himself as a harmless old man. “Please give me something to drink,” he said to Sita. “Certainly, Old Father,” said the tender-hearted Sita, inviting him in. In the blink of an eye he scooped her up in his arms and, despite her angry cries for help, he flew off with her to Lanka. When Rama and Lakshmana returned to their dwelling place they were dismayed to find that Sita had vanished. Rama was distraught, and he and Lakshmana searched everywhere for her. They finally encountered Jatayu, the Vulture King, lying wounded on the ground. He told them a strange tale. Rama and Lakshmana immediately began to seek for word of Ravana’s whereabouts. In their search they came across Sugriva, the King of the Monkeys. One of Sugriva’s followers was the powerful monkey Hanuman, who became one of Rama’s most faithful devotees. Sugriva, Hanuman and all the monkeys eagerly agreed to help Rama in his search. They fanned out in all directions looking for Sita. It was Hanuman who flew over the sea to the far off island of Lanka, where he finally located the weeping Sita. Then Hanuman played a trick on Ravana and the demons. He allowed himself to be captured and bound with ropes. The cruel demons set fire to his tail, whereupon he broke his bonds, and leapt from roof to roof, setting fire to all of Lanka. Hanuman then returned to Rama and told him of his discovery. Rama, Lakshmana, Hanuman and an uncountable multitude of fierce monkeys marched towards the sea. With tremendous energy the monkey army built a bridge of rocks, which they crossed. They marched right up to the very gates of Ravana’s palace. “Who dares invade my kingdom!” shouted the enraged Ravana. He sent out his demon army to attack the monkeys. For many days Rama and Lakshmana and the courageous monkey army fought off the ferocious attacks of the demons. Ravana used all the deceitful and cunning tricks he could think of, but Rama and his allies were able to defeat each one and drive the demons back. Finally Rama and Ravana encountered each other on the battlefield. They fought ferociously, but Ravana was finally defeated and killed by Rama. Imagine the joyful reunion of husband and wife! Rama and Sita were reunited to the loud cheers of Lakshmana, Sugriva, Hanuman and all the monkey army. Rama, Sita and Lakshmana bade a fond farewell to their monkey friends, and then made their way back to the royal palace of Ayodhya. All along the way the joyful people lit lamps to celebrate their triumphant progress. The magnificent city of Ayodhya was ablaze with lights, as the four royal princes were reunited. Rama and Sita ascended the throne to rule wisely for many a long year. And to this day the Festival of Diwali re-enacts this triumphant return of Rama and Sita, and the final victory of goodness over evil; truth over ignorance; and light over darkness. All the mice hugged each other, and danced about, and a few grew so excited that they fainted on the spot. Several more mice swooned at this suggestion. All of them shivered and shook. The clack, clack, clack of their knees knocking, and their teeth chattering, drowned out all other sounds. And with that she snatched up the bell, and headed for the crack in the wall, which led outside to the waiting cat. As little Picnic-Bandit bravely made her way into the corridor, a hundred pairs of round mouse eyes stared first at the cat, and then at Picnic-Bandit. No one breathed, no one moved. Several mice prepared to faint again, in case that became necessary. The cat watched Picnic-Bandit approach, unable to believe his luck. His dinner was walking straight towards him! But before Picnic-Bandit got too close, she put her paws together and bowed low to the ground. The cat was very pleased to hear these words of Picnic-Bandit, and decided he would wait just a moment or two before gobbling her up. The cat was extremely pleased with these words. For too long, he felt, his great qualities had not been recognised. Now these mice were going to make him their King. He graciously agreed. Picnic-Bandit bowed even lower, holding out the bell and the ribbon, for the cat to see. She hardly dared to breathe. The Cat solemnly nodded, and Picnic-Bandit slipped the ribbon over his head and tightened it. Then she scampered as fast as she could back to the safety of the nest. From that day to this, the mice feasted happily on the crumbs of the palace, safe and sound, ready to run and hide as soon as they heard the tell-tale tinkle of their approaching “King”. Brave words mean nothing, without brave deeds. There is an ancient curse upon your royal house. It has been working its mischief for many hundreds of years. With the succession of each new king of your royal dynasty, the effects of this curse grow steadily worse. A great injustice has been done to your remote ancestors and, until that injustice is undone, the catastrophes of Koshala will increase until the Kingdom falls. King Bhagiratha was filled with consternation. What is this great injustice? How can it be overcome? What must I do to right the wrong done to my ancestors? With that, the Counsellors told Bhagiratha of King Sagara’s one hundred Horse Sacrifices, and the strange death of his sixty thousand sons. Oh Great King of Koshala, they concluded, When the funeral rites of these princes are properly performed, the suffering of your Kingdom will come to an end. King Bhagiratha was astonished at this tale. Oh Wise Ones, tell me at once, how I may perform the funeral rites for these ancestors of mine? Another of King Bhagiratha’s counsellors replied: We have prayed and meditated and consulted all the holy books. And there is only one way to purify your ancestors’ misdeeds, and to save the Kingdom. Tell me, I pray, said the King eagerly, What must I do? Oh King, you must find a way to draw the heavenly river Ganga down to earth, to bathe the ashes of your ancestors. This will purify their souls, right the wrong done to them, and free Koshala from the ancient curse. So King Bhagiratha left his Kingdom in the care of his wise counsellors. He retreated to the high Himalayas. Once there, he prayed and fasted and meditated. His fervent wish was to bring Goddess Ganga down to earth, to wash away the impurities of his ancestors, and free his Kingdom from suffering. For years he begged the Gods and Goddesses in heaven to hear his prayers. Finally, Lord Brahma, the Creator of the Universe, heard Bhagiratha’s prayer, and was pleased with his perseverance and sincerity. Brahma summoned Goddess Ganga to his divine presence. Oh Beautiful Goddess, my devotee King Bhagiratha has pleased me. He begs that you descend to earth to wash away the ashes of his ancestors, and free his kingdom from its ancient curse. Go down, I pray you, and carry out the wishes of this righteous king. But Ganga was not happy with this request. She desired to stay in heaven. She was bound to obey the Supreme Creator, but she planned to exact revenge. She would roar down in such a torrent, that Mother Earth herself would be washed away. King Bhagiratha, and all the dwellers on earth, heard a deafening rumble as Ganga gathered herself, ready to fall upon them. Everyone began to tremble with fear. The Universe held its breath in terror, as Ganga prepared to unleash her destructive force. But King Bhagiratha calmed himself, and again sat perfectly still and began to appeal to the heavens. This time he prayed to the Great God, Shiva, Lord of the Three Realms, and Conqueror of Death itself. Oh Lord Shiva, Mightiest of all the Gods, prayed Bhagiratha, Come, I beg you, to our aid. The whole earth is threatened with destruction from Goddess Ganga’s mighty power. Protect us, who kneel and pray to you for mercy and deliverance. The Lord Shiva was pleased with King Bhagiratha’s prayer. He took up a position between heaven and earth, just as Ganga unleashed herself in a mighty torrent. She flooded out of heaven, pouring down towards the earth. But before she could obliterate the earth, Lord Shiva caught her in his long flowing hair, which was piled up high on his head. Ganga found herself trapped in Shiva’s hair. She fought and struggled to get free, but Shiva just laughed and, with a tiny fraction of his limitless power, held her fast. At last Ganga realised that all her efforts were futile. She was humbled by Shiva’s might. She realised the folly of her resentment and anger. She repented her intention to destroy the earth, and she bowed to Lord Shiva. Oh Great Lord Shiva, she said, You have bound me here in the locks of your beautiful hair. I am imprisoned by you and cannot escape. You hold me here, with a minute sliver of your immense power. I see now the error of my ways, and I make this promise for all time. If you free me, I will flow gently down to earth. I will wash away the ashes of good King Bhagiratha’s ancestors. My waters, having flowed through your hair, will be supremely holy. Anyone who bathes in my waters, will have all their impurities washed away. Shiva smiled, pleased at Ganga’s change of heart. Oh Beautiful Goddess, you who were intent on destruction, are destined to be the cause of mankind’s salvation! You flow in Heaven, and you will flow on Earth to wash away the sins of all mankind. And so it was, that the mighty Lady Ganga, fell from heaven into the matted locks piled high on Lord Shiva’s head. From there she flowed out to cleanse King Bhagiratha’s ancestors, and to free the Kingdom of Koshala from its ancient curse. And, even to this day, she blesses all who bathe in her holy waters. In episode One we heard how Savitri, a beautiful Princess found her one true love, Satyavan living in a forest. She returned to her parents, King Ashvapati and Queen Malavi of Madura, who were overjoyed. But their joy turned to sorrow when Narada, the holy dweller in heaven, told them all that Satyavan was fated to die on the first anniversary of their wedding. And worse, if he did so Savitri was forbidden by law to marry again. Her parents tried to talk her out of marrying Satyavan but her heart was his already, and she departed for the jungle vowing to marry Satyavan and to defeat Death himself. When Savitri reached the jungle she found her way to the simple hut of Satyavan and his parents. Straightaway they were united as husband and wife. She joined her husband and her parents-in-law, she gave up her fine dresses for simple clothing and exchanged all her beautiful jewellery for a few bangles on her wrists, which clinked and rang out as she busied herself with the ordinary work around the simple hut in the jungle. She kept Narada’s fearful prophecy a deep secret in her heart. She had limitless faith in her love for Satyavan, and his for her. So she spent the year working with her husband in devoted service in the jungle to her new family, and she prayed daily to all the gods, but she saved her special prayers for Yama, the God of Death, who, according to Narada, was going to come on the anniversary of their wedding to claim her husband’s soul. Nearly a year went by in this manner until, three days before their wedding anniversary, three days before the fateful day upon which Yama the God of Death was to come for Satyavan, Savitri announced that she would stop eating and drinking . King Dyumatsena and his queen and Satyavan tried to talk her out of it. But Savitri told them that she had taken a vow to fast before her wedding anniversary. Two more days went by and then, on the fateful morning, Satyavan hefted his axe onto his shoulder, ready to go out into the jungle to cut wood for their fire. Savitri, seeing him about to set off, asked to accompany him. Again, Dyumatsena and Lakshmibai tried to talk her out of it. Satyavan too tried to dissuade her. Satyavan finally agreed, and so he and Savitri set off together into the jungle. All morning Satyavan worked hard without a break chopping wood. Savitri sat quietly praying to Yama the God of Death. As the sun rose high in the sky Satyavan’s axe strokes began to slow down. He wiped the sweat from his forehead. So saying, he lay down and put his head in Savitri’s lap. Savitri sat perfectly still, listening to her husband’s gentle breathing as he fell into a deep sleep. Then she heard another deeper sound. The rhythmic thump, thump, thump, thump of an approaching beast. The noise grew louder and the ground began to shake. Soon the leaves of the jungle parted and Yama the God of Death appeared riding on an enormous black bull. As prophesied by Narada, Yama the God of Death had come in person for the soul of Satyavan. Savitri greeted him politely and, without disturbing her beloved husband bowed low to the God of Death. Then, Yama took a noose of rope and with it he caught the soul of Satyavan and pulled it from his body. Satyavan breathed his last. Then Yama turned the bull and headed back towards the jungle path from which he had come. As Yama, riding his great black bull and holding the soul of Satyavan, made his way along the jungle path he became aware of a gentle sound behind him: Clink, clink, clink, clink. He stopped and turned the bull around and there was Savitri, whose bangles were gently ringing as she followed Yama down the path. When Yama stopped she bowed low to him. And Savitri again bowed low to the God of Death. Yama was pleased with her words, and he gave her his blessing. Then he turned the bull around and headed, once again down the jungle path towards his kingdom, taking the soul of Satyavan with him. After a while he again became aware of a gentle sound: Clink, clink, clink, clink. Once again he stopped and turned around and found Savitri standing on the path. Savitri bowed low and thanked the Lord of Death and asked that her father-in-law receive back his sight. Again Savitri bowed low and asked that her father-in-law receive his kingdom back. “Done!” said Lord Yama with a wave of his mighty arm. And with that Yama, the Great Lord of Righteousness, carefully handed the soul of Satyavan to Savitri, who again bowed down low. And then each turned and went their way, Yama to the underworld, and Savitri back to the forest clearing where the body of her husband lay peacefully. She knelt down beside him and gently placed his soul down upon him. As his soul re-entered his body, Satyavan stretched and yawned. Together they returned to the hut where Dyumatsena and his Queen Lakshmibai were marvelling at the return of his sight. Just as Savitri and Satyavan approached, a messenger came riding through the jungle with startling news. The evil ruler of Shalwa had died suddenly and the people were clamouring for Dyumatsena and Lakshmibai’s return as their King and Queen. At this point Savitri sat and closed her eyes and offered up a silent prayer of thanks to the Lord Yama. When her husband and parents-in-law asked what she was doing Savitri explained the whole sequence of events to them. They were amazed and bowed down to her and worshipped her as the perfect example of devotion, intelligence and courage. They returned to Madura and King Ashvapati and Queen Malavi and all the people of Madura rejoiced at the return of their beloved Princess and her handsome husband. Together they ruled for many a long year and, as foretold by Yama, the God of Death, the story of Savitri and Satyavan is told and retold even to this very day! Long, long ago heroic kings and queens ruled in India and wise sages roamed the land performing great sacrifices to the Gods and Goddesses. At this time, brave King Ashvapati sat on the throne of the Kingdom of Madura. He and his beautiful Queen Malavi ruled wisely and well and the people of Madura were loyal and happy. The king was tall, handsome, and astute and his queen was serene, intelligent and wise. The palace of Madura was large and picturesque with rose pink walls and latticed windows. Elephants and peacocks strolled through vast pleasure gardens, and the sound of water splashing in ornate fountains filled the palace. Laughter and conversation could be heard everywhere as servant girls and important Ministers of State hurried here and there to do the bidding of their beloved King and Queen. But the happiness of Ashvapati and Queen Malavi was not complete because they had no child who would grow up and, in turn, rule the kingdom wisely and well. So the King and Queen prayed to Savitra the Sun God, for a child. Pleased with their prayers and sacrifices Savitra, the Sun God, granted their request and soon a beautiful baby girl was born to them. A princess for Madura! The King and Queen were overjoyed, and all the people of Madura rejoiced as well. The streets were filled with the sound of jubilation as everyone hurried to dress in their finest clothes. And they rushed into the city to celebrate the birth of their princess. “What shall we call our new daughter?” Queen Malavi asked her husband, King 30 Ashvapati. And so it was that Savitri grew into a beautiful and loyal daughter to her doting parents. She was instructed in all the arts and sciences and proved a willing and clever student, absorbing easily all the lessons of her teachers. She could read, write, sing and dance. She could discuss learned questions with the wise sages, and all Madura looked forward to the day when she would marry a great prince, who would join her in ruling Madura. Finally the day came when Savitri was grown up and of the age when, her thoughts and those of her loving parents, turned to who would be a suitable husband; a partner for life. So her parents, King Ashvapati and Queen Malavi said to Savitri: “Savitri, you are the apple of our eyes, you are like sunshine on a dark day. The people of Madura love you, we love you. The time has come to consider that important question for any young person. To whom will you promise yourself for life? Whom shall you marry? And so from that day, princes came from far and wide to seek the hand of the beautiful Savitri. But none was found who could satisfy Savitri. One prince was lazy, another arrogant, a third rough, a fourth weak, a fifth selfish and so on, and on, and on. King Ashvapati and Queen Malavi began to despair. Would no suitable prince ever be found? Without another word Savitri, with a retinue of followers set out, guided by the Gods themselves to find a husband for Savitri. Little did she know, that she was fated to find her love, but she was also to face the hardest test of all. She was to lose him to the God of Death one year after their wedding day! One day, after many weeks of journeying through many kingdoms, Savitri and her followers were travelling through a dark and forbidding jungle. Birds screeched, and monkeys chattered as they passed and snakes slithered from their path. The servant girls were round-eyed with fear. The soldiers clutched their weapons, ready to rush to the rescue of their beautiful mistress. At last they came to a clearing and saw to their great amazement a small hut built of wood and roofed with broad banyan leaves. Sitting quietly outside the hut, wearing simple clothes was an old man and his wife. Savitri and her followers seated themselves comfortably on the ground and took a little water and some of the old man and woman’s simple food. When they were satisfied, Savitri again politely asked them how they had come to live in the jungle. On hearing the name of Satyavan, Savitri’s heart leapt. It leapt even more when Satyavan, handsome, strong and calm, emerged from the jungle carrying an axe over one shoulder and a heavy bundle of firewood easily under the other. He too stopped at the sight of Savitri, and their eyes locked on each other. Each knew they were destined for each other. Savitri had found her husband. They received the blessing of King Dyumatsena and his Queen Lakshmibai and Savitri hurried home to tell her parents, while Satyavan stayed in the forest continuing to care for his aged parents. Imagine the mixture of joy and sadness in the palace of the king of Madura. For Savitri had found a husband, but he was a poor dweller in the jungle; she had found herself a prince! But his blind father had lost his kingdom. And worse news was to come! The whole Kingdom of Madura could talk of nothing but the story of Savitri and Satyavan, when one day Narada the Holy Dweller in Heaven, chief devotee of Lord Vishnu, came to earth for one of his regular journeys to see how the world was faring. King Ashvapati welcomed Holy Narada and offered him a seat, some water and some fruits. When the Holy One was at his ease he enquired about the state of the kingdom. King Ashvapati told him the news of Savitri’s search for a husband and the eventual outcome, the discovery of Satyavan. With great sadness in his heart King Ashvapati summoned the beautiful and modest Savitri into the great hall of the palace to hear the dreadful news directly from Narada. When Savitri had listened carefully to Narada’s words, King Ashvapati tried to persuade his daughter to change her mind, to choose someone other than Satyavan as her husband. But Savitri remained firm. But Savitri remained immovable. She insisted that she would marry Satyavan. With this, King Ashvapati and Queen Malavi agreed, and the eager Savitri left her parents’ palace and took her journey to the jungle to marry Satyavan and to try to defeat Death himself! The Story of Savitri and Satyavan is continued in Episode 2. The Buddha was a great and holy man who was born on earth as a Prince. But he gave away his Kingdom in order to travel the earth teaching men and women the path to freedom and peace. He told many wonderful stories to help people understand how to live a happy and peaceful life, and to find a pathway to God. In the kingdom of Benares, brave King Devadatta was just and kind. He ruled wisely and all lived happily in prosperity. Beyond the kingdom walls, was a dark jungle; many animals lived within its shadowy limits. Monkeys leapt from branch to branch, screeching to each other. Colourful parrots squawked their cheerful greetings. Timid deer trod warily through the dappled shade, and snakes and other slithering creatures slid through the layer of moist leaves, which formed a soft carpet underfoot. The King of all these beasts was a ferocious and cruel Lion. This fierce Lion spent his days hunting and feasting. He would pad softly through the green undergrowth hunting his prey, brushing the straight stalks of grass aside with his powerful shoulders. His golden shaggy mane framed his face. When he opened his mouth, two rows of razor-sharp teeth gleamed in the sunlight. When he roared, the whole jungle shook. Monkeys fell from the trees, the birds flew this way and that, the deer pricked up their ears and fled in panic, and all the other jungle creatures ran for their lives. One day, the Lion was eating greedily, when a bone stuck in his throat. He swallowed hard and shook his head, but the bone was stuck fast. He roared in pain and anger, and every creature in the jungle ran, flew, swam or slithered away as fast as they could. The Lion could not eat, he could not sleep, and the bone made his throat swell, so that it was even hard for him to breath. Was this the end of that fierce and cruel Lion? A day or so after the Lion’s troubles began, a beautiful white Crane was flying over the jungle. He heard the Lion roaring piteously and flew down to see what all the fuss was about. He saw the Lion pacing back and forth, shaking his head, and roaring. Unafraid, the Crane settled a safe distance away, on the branch of a nearby tree. The other jungle creatures, seeing the fearless Crane, came creeping back to see what would happen. The Crane watched the Lion for a few minutes and then spoke. The Lion looked to the left. He looked to the right. He turned around one way, and then he turned around the other way. “Who is speaking? Show yourself,” he said in a rasping voice, for the bone was making it difficult to speak. So the Crane flew down from the safety of his perch in the tree and fluttered to a halt near the Lion. All the other jungle creatures looked on in amazement, hardly daring to breathe as the Crane walked calmly up to the mighty King of the Jungle. The Lion did as he was told and lay down as gently as a kitten. He opened his mouth as wide as he could. The Crane saw the two rows of razor-sharp teeth gleaming in the sunlight. So, before he put his head into the Lion’s mouth, he picked up a stick and wedged it between the jaws of the Lion, holding his mouth open. Only then did the Crane lean down and put his head into the Lion’s mouth. He peered down the Lion’s throat and saw the bone stuck there. He pecked once. He pecked twice. He pecked a third time. The bone flew from the Lion’s throat. As the Crane withdrew his head from the Lion’s mouth he gave the stick a sharp rap with his long pointy beak, and it followed the bone out of the Lion’s mouth and landed nearby on the grass. As the Lion’s jaws snapped shut, the Crane flew safely back to his perch in the tree. The Lion was overjoyed. He roared his delight. All the other jungle creatures scattered once more in fear. The Lion frisked back and forth, and then ran off into the jungle in search of a tasty meal, without so much as a “Thank You” to his kind rescuer. A few days later the Crane was once again sitting on a tree branch preening his feathers, when he heard the low growling of the Lion not far off in a nearby jungle clearing. “I will go and test my new friend Mr Lion”, the Crane thought to himself. And he flew off to find the Lion. He had not flown far when he saw that the Lion had settled down to his meal. So the Crane again landed, out of harm’s way, on a nearby tree branch. The other jungle creatures carefully crept closer to see what would happen this time. The monkeys took up their station among the leafy branches of the trees, right next to the parrots and other colourful birds. The deer peeped from behind thick bushes, anxious to remain hidden, but equally anxious to hear what the Crane would say to the Lion. And all the slithery, slidey, crawly creatures sat on the ground, peeking out from behind rocks and twigs. For one with this attitude! Avoid those who feel no gratitude for a good deed. In days of yore, in the Golden Age, when legendary Kings and Queens of India communed freely with Gods and Goddesses, King Sagara ruled the Kingdom of Koshala with his brave Queen Sumati. Together they had sixty thousand sons, all of whom were mighty warriors, quick to anger, and ever ready to fight their father’s enemies. King Sagara made a solemn vow to perform the Horse Sacrifice one hundred times. In this powerful sacrifice, the prayers of a thousand priests sanctified a pure white horse. The white horse was then set free to roam the land for a year. If the horse wandered into a neighbouring realm, the ruler of that Kingdom had to submit to King Sagara, or face the wrath of his sixty thousand warlike sons. This potent ritual gave Sagara immense power. Ninety-nine times the pure white horse was released. Ninety-nine times it wandered into neighbouring Kingdoms. Ninety-nine times King Sagara’s sons accepted the surrender, and rich gifts of countless rulers of other lands. But Indra, the Chief of the Gods, grew jealous of King Sagara’s power and wealth. He devised a cunning plan to thwart Sagara’s hundredth sacrifice. At this time, there lived a holy man of immense spiritual prowess named Kapila. Indra knew of the unbounded power of Kapila’s spiritual energy, which made even the heavens themselves shake. Kapila had retreated underground to meditate. So Indra stole the hundredth pure white horse of King Sagara, from under the very noses of the King’s sixty thousand sons. He took the horse underground, to the cave where Sage Kapila sat motionless in blissful meditation. Indra quietly tied the pure white horse to a stake in the floor of the cave, just beside Sage Kapila. Then he withdrew to enjoy the results of his troublemaking. When King Sagara was told of the disappearance of his horse, he was enraged. He angrily ordered his sixty thousand sons to search the world high and low for the missing horse, and to punish the thief who had stolen it. King Sagara’s sons set off in a fury. They crossed back and forth over the whole earth, creating widespread destruction as they searched everywhere for the horse. Finally, unable to find the pure white horse anywhere on earth, they began to search for it in the underworld. Eventually they came upon Sage Kapila, sitting in silent meditation. And what did they see next to him? It was none other than their father’s pure white horse, standing quietly next to the holy man. The sixty thousand sons of King Sagara flew into a rage. They had found the thief! With a shout, they drew their swords and ran towards Kapila. At the sound of the approaching horde, Kapila, angry that his meditation had been disturbed, opened his eyes. Bolts of scorching fire shot out from his eyes, and the sixty thousand sons of King Sagara were instantly reduced to ashes. The sixty thousand piles of ash lay undisturbed in that underground cave for hundreds of years. The funeral rites of those mighty princes were never properly performed, and the effects of this injustice grew and grew. As the years went by, the Kingdom of Koshala suffered more and more. Finally, many years after the burning of the sixty thousand sons of King Sagara, a new king ascended the throne of the ancient Kingdom of Koshala. His name was Bhagiratha, and he was a wise and benevolent monarch. But Koshala was troubled. Natural disasters afflicted its people. Earthquakes shook the land, avalanches tumbled down mountains, floods carried away whole villages, and droughts dried up fertile farmland. And worse! Neighbouring kings attacked the borders of King Bhagiratha’s land, and made off with cattle and other valuable property. King Bhagiratha and all his wise ministers were perplexed. Bhagiratha was faithful to his royal duties, and made sure all the sacrifices to the Gods were properly performed. Why was his kingdom under attack from both divine and human forces? The King called a meeting of his Council, and instructed them to spare no effort to find out the cause of these troubles. Having consulted the stars, prayed to the Gods, meditated deeply, and discussed the issue long into the night, the Council of the Wise approached their beloved King. King Bhagiratha was eager to hear. He sat forward on his throne, and encouraged the Chief Counsellor to continue. Long, long ago when heroes and heroines roamed the earth, there was a great King called Akbar who lived in a beautiful palace with his Queen Mariam. The palace was full of ministers and soldiers, maid-servants and cooks, guards and entertainers. People rushed here and there on important business, down corridors, up staircases, and through lovely gardens with splashing fountains. All were busy, hurrying to satisfy the least desire of their beloved King and Queen. This story is not about brave King Akbar, or intelligent Queen Mariam, or any of their ministers or soldiers or servants. No, because living in that palace along with all these people, was a wonderful assortment of creatures: song birds in golden cages, peacocks strutting proudly beside pools of cool water, elephants in their pens, and horses stamping their feet ready to ride off to battle. This story is not about any of these impressive creatures. No, because also living in that palace, in the hollows and in the cracks and crevices of the walls of that magnificent dwelling, lived a band of mice. And this story is about those little mice, and how they saved themselves from great danger. Come with me, Children! Let us find out what these tiny creatures were up to. From their cosy holes and tunnels, the mice of the Palace of King Akbar and good Queen Mariam, ran to and fro finding scraps of food, crumbs of bread, and the tasty leftovers. They carried them back to their nest for their daily feast. They lived happily and ate well, for even the crumbs of a King and Queen are worth eating! This went on day after day, and year after year, until the King and Queen could stand it no longer. Finally Queen Mariam spoke to the Grand Vizier: “Get rid of these mice!” she cried. The Grand Vizier spoke to the Chief Cook: “These mice have to go!” he ordered. The Chief Cook told the Captain of the Guard: “Those mice are not nice, out they must go!” she roared. And the stable boy, who had no one left to order about, thought and thought, and finally he went to the market square. He searched high, and he searched low. He searched for hours, when all at once he found exactly what he was looking for. There, under a fishmonger’s stall, he spied a sleek tabby cat with a crafty gleam in his eye. The stable boy quietly crouched down. And whoosh! He scooped up the cat and popped him into a sack, and ignoring the yowls and screeches, and bumps and lumps, the stable boy carried the bumpy, lumpy, yowling sack back to the palace.